Hippy Liberal or Benign Dictator, what sort of parent are you? Some parents seem to have the perfect relationship with their children, while others have to battle every step. Some parents have family discussions, with democratic, meaningful outcomes for the whole family while others have family structures that are more like benign dictatorships – efficient and respectful. But why do some parents gravitate to one style and find it hard to adapt to another? Which style is best? Developmental and family researchers have been studying many aspects of family functions since the 1920’s. One of the most important and practical products of all of this study has been the concept of Parenting Style. Simply explained, parenting style refers to the methods that parents use to interact with their children and run their families. Identifying parenting style captures two important elements of parenting – how you respond to your children’s needs and expectations, including your warmth and supportiveness to them; and how you go about imposing your needs and expectations on your children through behavioural controls, discipline, rule setting and enforcement. The single greatest influence, probably without any surprise, is that arising from your experiences with your own parents. Your own parents act as your first role models for parenting (good or bad) and most parents eventually recognise that they have either copied or rejected (deliberately or unconsciously) the style of parenting that they themselves have experienced. These and other factors all interact to influence the style of parenting that each parent uses. It is not uncommon for couples to have different parenting styles and often compromises have to be worked out between them. Most of the researchers in the field agree that there are three major types of parenting styles. The Authoritarian parent tends to be heavily rule focused and offers little negotiation in their style of parenting, (think Red Forman in That 70’s Show). They are highly demanding and directive, but not very responsive in terms of listening to their children. They are obedience- and status-oriented, and expect their orders to be obeyed without explanation. These parents provide well-ordered and structured environments with clearly stated rules. The authoritarian parent is often lacking in emotional warmth and supportiveness and tends to dismiss or minimize the child’s emotions. These parents can be quite controlling, judgmental and perfectionist and expect their children to be likewise. The Authoritative parent lies midway between the two extremes. They allow their children room to develop and make mistakes while placing definite boundaries and expectations in place. Most importantly they update those boundaries and expectations as their children develop. They are assertive, but not intrusive and restrictive. They use discipline methods that are designed to be supportive, rather than just punitive. They want their children to be assertive as well as cooperative, socially responsible, and to exercise self-control for their emotions and behaviours. They monitor and impart clear standards for their children’s conduct. The child is given some input into family decisions at an age-appropriate level and this input changes and increases over time as the child matures. The Permissive (also referred to as “Indulgent “) parent is basically the opposite of the Authoritarian; While they are typically warm, affectionate and liberal, they put few limits on their children and they are inconsistent with those they do set. They tend to be very responsive in style, rather than taking an active lead in the parenting relationship with their children, they react to situations without providing guidance. They are non-traditional and lenient and do not require mature behaviour from their children (translation: they have spoilt kids). They allow their children to make a great deal of their own decisions about things, even when the children are not really equipped to make informed choices. They also typically avoid confrontations in the family. While the Authoritative parenting style tends to be the most effective over time, largely because it is the most adaptive – the parents approach evolves as the child develops. It doesn’t mean that the other two are bad or wrong – sometimes family, cultural and personality factors mean that a particular style is more appropriate than at others. 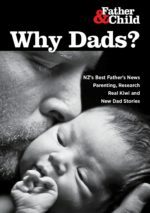 The most important question to pose about parenting style with your children is: Is it effective; does my child and family development benefit from the way I am doing things? If the answer is yes, then fine but if there is room for improvement then consider amending your parenting style to improve the parenting relationship with your child. How you interact with them is the first social role-modelling that you children receive and will have a lot to do with how they interact with others. Want to know what sort of parent style you have? 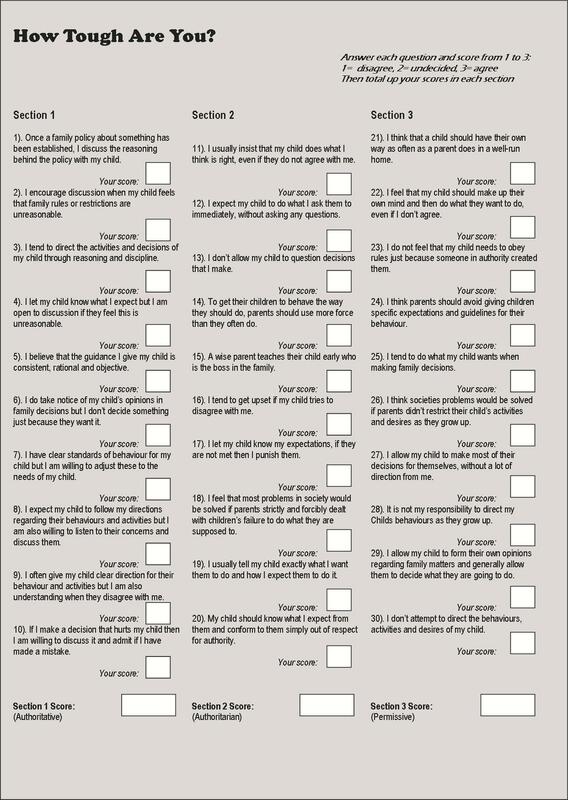 Try the parenting style questionnaire at the bottem of this article. Are there different adult outcomes for children who experience different parenting styles? There is growing research evidence that the style of parenting that a child experiences influences their development and personality. Various behavioural and emotional outcomes have been associated with different childhood parenting style experiences. Children raised in an Authoritarian home often result in the child feeling powerless and out of control or rejected and isolated. Children raised in a Permissive style can develop behaviour problems and are often intolerant of uncomfortable feelings or expectations because they are used to their parents providing the quick fix. The indulgent parent tends to set few demands and has unclear expectations of the child. In today’s society, the indulged child has become a topic of great controversy since families with two working parents more often have the financial means to provide excess material things to the child. Children from an Authoritative home are more likely to have better skills at balancing societal demands (e.g., thinness, perfectionism, peer pressure) with their need for independence. It appears that one key component to the success of this parenting style is the balance of clear expectations and emotional responsiveness to the child. This type of parent promotes the child’s ability to self-regulate emotions, the individuality of the child, accountability and tolerance. These traits are strongly associated with high self-esteem in children, which is a protective factor against many social issues. How strongly each parenting style is connected with different outcomes is widely debated. Research results to date are correlational – this means that each parenting style has been associated with these different outcomes, sometimes quite strongly, but that there is not strong enough evidence to say that a parenting style will cause a particular outcome. The main take home message for parents is that the parenting relationship with your children is most effective when it is a balance of firmness and flexibility – where limits and boundaries exist but the child feels confident that they have an appropriate input into the family relationship. That helps towards building confident, independent children who develop into effective, happy adults. Your parenting style isn’t fixed; education and self-awareness can help any parent to adapt their personal style to one that is more effective for their family. Democratic: A mix of Permissive & Authoritative parenting. This is very common in a two working-parent family, where time limits the level of input the parent has in the family relationship. Nonauthoritarian-Directive: an authoritative style with more parentally centred control, but not autocratic or intrusive. Very common for parents of younger children where the child’s input into family issues is limited. Permissive-Directive parent. Permissive parents who are approaching the Authoritative style. Uninvolved: the classic ‘neglectful’ parents. They score very low on all sections, they probably wouldn’t be doing the questionnaire in the first place…. Below Is The Formentioned Questionaire. To Complete this click on the thumbnail and the picture will expand. Right click,save and print.